Granola is tricky. It leads a double life. 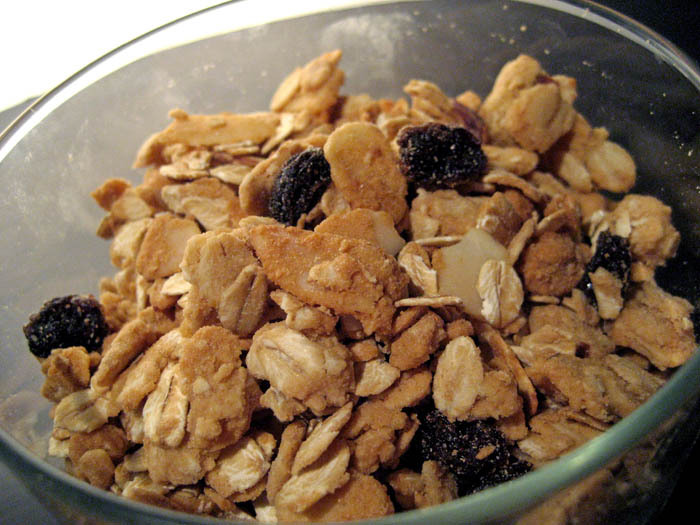 It wants you to believe that it is healthy with its oats, nuts and dried fruit, but you are wise and know its game. You know that where there is crunchy sweetness, there is calorie dense sugar, butter and maybe even some flour, but damn it if you don’t let it seduce you time and again anyway. But you know what? At least you made it. At least you’re in control of how sweet it’s going to be, how crunchy it’s going to be, what kind of flavors you’re going to use and the fact that there’s no artificial ingredients or preservatives in it. And that is why you should make more granola. For some odd reason I always thought I needed a rimmed baking sheet to make granola. Like the oats would turn into Mexican jumping beans and leap off the sheet. I was wrong. I added raisins because that’s what I had. I had raisins because that’s what I like. One trick I’ve learned with granola is if you like big chunks, keep it smushed together on the pan while it bakes and wait until it cools to break it up. 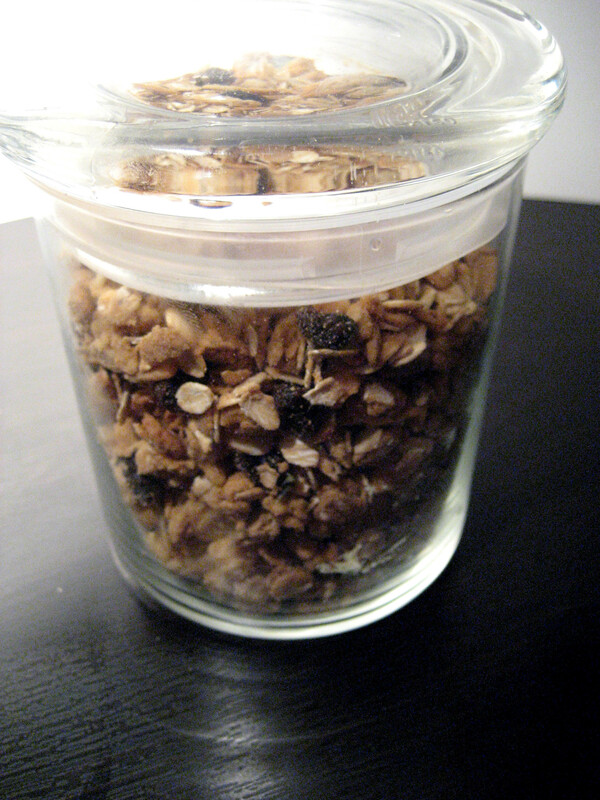 Another trick I’ve learned about granola is it makes a good gift. Find a pretty jar at a craft store and tie a ribbon around it. Preheat oven to 350 degrees and grease a small baking sheet with coconut oil or butter. You can also line the sheet with parchment paper. Stir together the honey, butter and vanilla. In a separate bowl combine; almonds, flour, oats, salt and stir. Add honey mixture to the oat mixture and stir until combined. 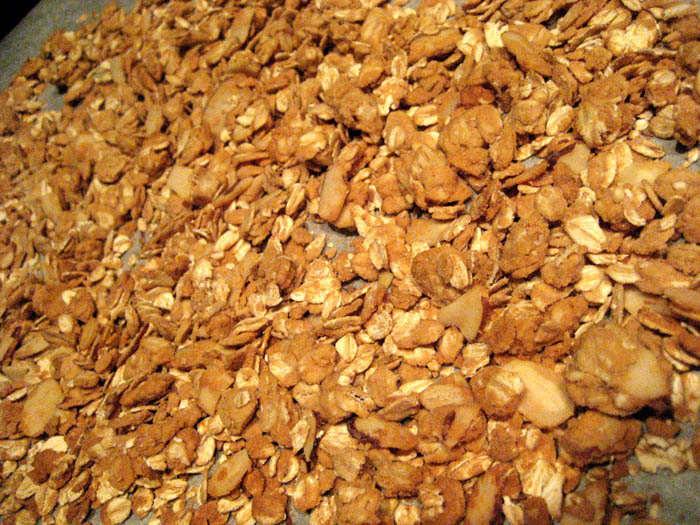 Spread the oat mixture onto prepared pan and bake for 10 minutes. Remove, toss and place back into oven for 5-8 more minutes.